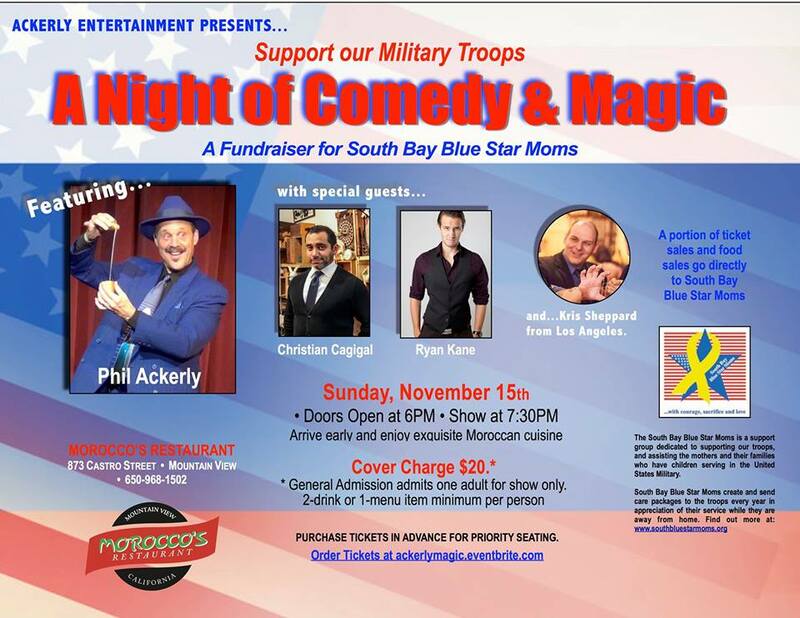 In a week, I’m going to be traveling up north to visit some friends and take part in Phil Ackerly’s Night of Comedy and Magic to support our troops. I’ll be performing strolling magic before the stage show (That features Phil Ackerly, Christian Cagigal, and Ryan Kane). 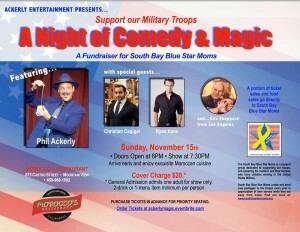 Come out to support our troops and to say hi! I’d love to meet you if you’re up in that area! Click on the flyer to the right for more info. It takes the same amount of effort to struggle as it does to thrive and succeed. 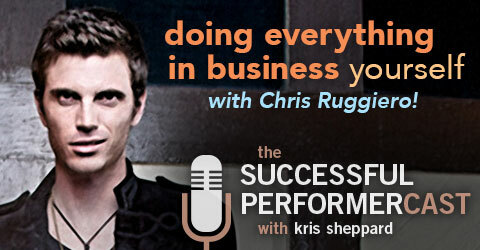 In Business, Should You Do Everything Yourself? • It helps you know what you should outsource or not. • When you do end up outsourcing, you know more about the task at hand than you would if you hadn’t tried it out yourself first. • Often times you’ll find things that you really love doing. • How to know when you need to outsource something. • Investing in yourself like in courses, specialized training, and coaches. 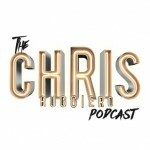 Chris Ruggiero Podcast — a show where variety entertainer Chris Ruggiero interviews other entertainers he meets in his adventures. In this show you’ll find incredible stories that will leave you intrigued, inspired, and ready to live your own dreams. He’s interviewed entertainers like Justin Flom, Jeff Civillico, Brett Loudermilk, and Barry Friedman. 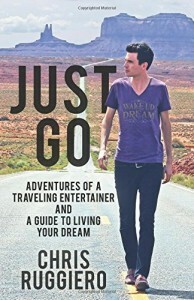 Just Go: Adventures Of A Traveling Entertainer And A Guide To Living Your Dream — In his debut book, Chris Ruggiero shares personal stories of being a traveling entertainer and offers tips and advice to create an adventurous life most people only dream of. The book is a collection of small and easily digestible essays. Performercast Listeners can save a couple bucks! • Getting things done now rather than later. • Talks about his beginnings as an entertainer. • Inner doubt whether you’re “good enough” to be an entertainer. AKA The Impostor Syndrome. • Individually connect with people in the crowd during your performances. • Working with agents and how he got his first agent by doing some showcases. • This is the best time to be living in regards to building an audience and not having to ask permission to do something. • How Chris wrote his book. • Physical vs. digital publishing. • Be good and keep showing up. • Whatever gets scheduled, gets done. Tells about a time on a unicycle where he took a nice little spill during a show. His recent appearance on the Ellen Degeneres Show. Staying focused and on task. Don’t wait to start something you’ve been thinking about. Take your first step today. A camera, on your phone or otherwise. Where can we find Chris Ruggiero? ← Performing at Phil Ackerly’s Night of Comedy & Magic!